omoro - Wonderful image! That’s great! 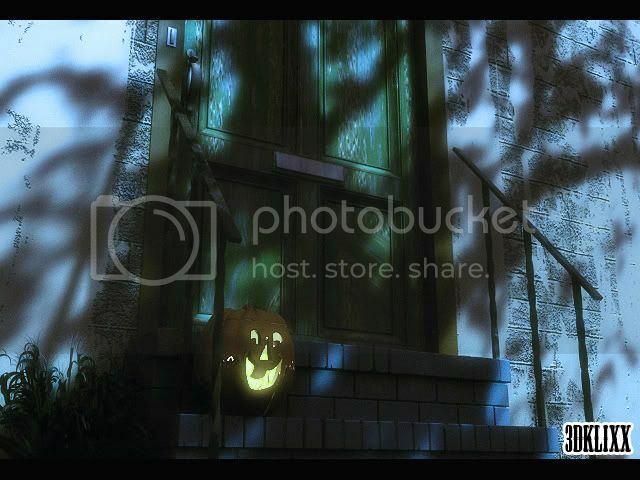 Maybe if you’re doing another version work on the translucency of the pumpkin more so the sides of the holes carved in it go brighter, and maybe have the doorbell lit up? leiluparker - Looking good. If you want more definition in the dark areas that make up much of the image, you might try some rim light on key edges. It seems like there’s doubled shadows, where even the part of the main light that’s in shadow has an extra shadow of the railing cast onto the wall. simonjaap - That’s great! I agree, keep working on the translucency. My first lighting challenge… and what a great theme for this challenge. RezaTJazayeri, you can go to apple system preferences/display/color, select your monitor, clik on calibrate, and choose gamma 2.2. I hope this will help. the brighter version of your work looks a lot better. RezaTJazayeri - Good start! I like the subtle lighting around the door number in the background. Try to get the pumpkin to look more translucent, with light coming through the edges and brightening the edges of the holes. You`re right. 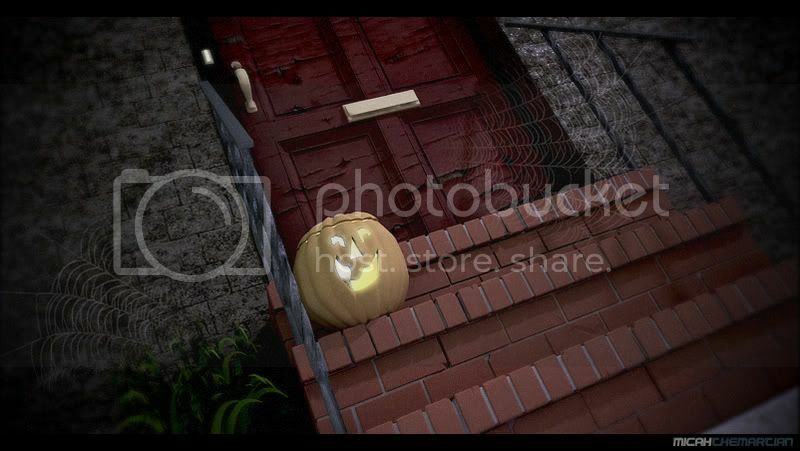 the pumpkin should look more translucent… I hope using FG make it look better. You`re render looks pretty good omoro. Here’s a quick and dirty one. All done in 3ds max 2008 using the new photographic exposure control, the new self-illumination options, the enhanced glare shader, and other… fun stuff. As far as the Vista gamma goes, you might need to find a set of unofficial drivers on some site that has user scripted drivers… I’ve heard of people needing to get these drivers so that they could actually setup the video card options, and use programs like CAD without the 90+% decrease in performance. Thanks for the suggestions Jeremy, couldn’t do too much for centralizing the upper lights… The one above the door is the only one there… Other than that I had a directional as the moonlight with a projection map to give the leaves on the wall, and there was a back fill blue light to kinda fill in a crappy basic 3 point setup. I tried comp’ing some passes together so that I could control the shadows a little better… That and it’ll be a lot easier and quicker to do any other changes down the road. Here is a new render of the scene. Once again, critiques and comments always welcome. Alright, it might just me being the noob i am, but i was playing around with the translucency and the upper half of the pumpkin just is very different than the bottom half, as you can see in the pic, it has the same material and everything… im wondering how i can get rid of that? 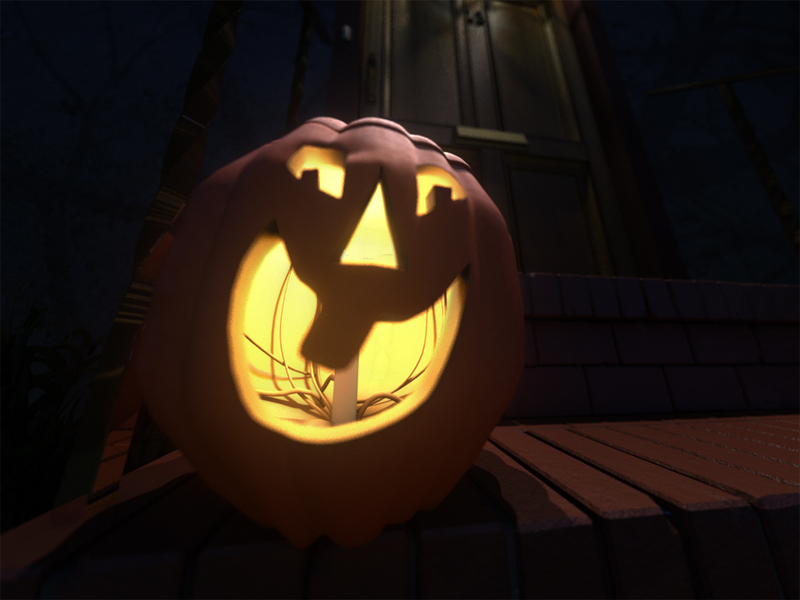 Ye, I think it’s because, in the top half of the pumpkin the normals of the faces are flipped. Could be something that happend when importing. No textures yet…it’s the default colors that came with the file. Rendered in Mental Ray and Maya. Slight contrast tweak in Shake. I hope to finish this one in time. *edit: forgot to say it’s traditional lights. But may try a GI version. Indeed I had 2 moon lights casting shadow. I got rid of one and put in 4 sky lights. Also re-painted my light map. So thanks again Jeremy. I want to have a credible light source to light up the number 13, but don’t want it to distract from the pumpkin, especially at this camera angle, from where you can easily see the glaring light bulb. Jacobborsting - Good start! It’s a little hard to interpret what’s supposed to be in the foreground there. maybe the bottom of the pumpkin would have a little more glow to it? MasterZap - Wonderful image. I like the texture on the metal, the look of the grass really nails the “night exposure” feeling. The translucency of the jack-o-lantern looks more like the translucency of a paper lantern more than a thick-walled pumkin though. This weekend I’ll carve a pumkin and post some reference pictures at different exposures. psycosven - Looking good. Maybe you could soften the shadows of the railings on the walls. I think your composition looks very empty on the sides, but cropped on the top and bottom. Maybe switching to a taller aspect ratio would frame the scene better? simonjaap - It’s a nice scene. Once you solve the translucency problem & light the candle it’ll get a lot more believable. 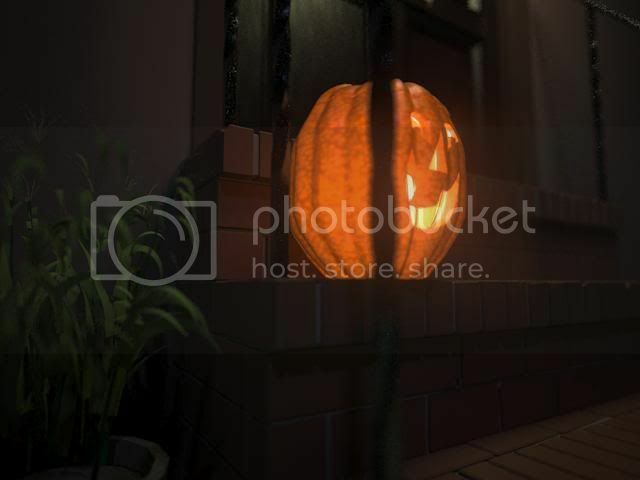 It seems like too much light is leaking out through the pumpkins onto the bricks below. swaroopindia2 - Nice scene! The translucency on the pumkin is a welcomed thing, but right now it seems to be turned up too bright. You might need some shadowing or occlusion on your fill light, because some areas like the door handle are lacking definition. There’s a link in my first post to a thread about posting methods. ACamacho - Really solid start! The cookie or shadow on the back wall looks really strange, the way it is sharply focused on the wall but blurred on the door. Nothing in real life would be like that, is it a contrast setting on a shader that causes that unusual effect, or what? Once you get the pumkin looking translucent and light up the candle more it’ll look more believable, probably it wouldn’t cause that much light to leak out of the back of the pumkin. leiluparker - Nice scene! I like the bat signal projected from the back of the pumkin. If you’re adding a lamp near the top of the frame then I think more of the surfaces right around the lamp should be lit up. The plants look like they are hitting too bright a green compared to the lighting on the rest of the surfaces. Yes I agree; the “translucency” isn’t even translucency, or even SSS, it’s actually a self-illumination thing I did. Hacky, I admit. And yes, I was really going for a “night exposure” look with a heavy DOF (very open iris) feel. Oh, did YOU TRY THE GAME? Yes generally is necessary only to flip normals in max. I’m sorry I’m not @ home since I’ve moved for some months abroad. otherwise I would have send as alwyas the max file to jeremy. I hope to have a chance to setup my pc in the weekend and give this one a try. I used mentalRays physical lens for the first time to get the blurry effect. Its got 2 controls only. one for the distance of focus and another one for the amount of blur. Is there a more advanced way to control this node?